The wave of destabilization now sweeping through the Middle East and North Africa could aggravate the situation in Central Asia and in Russia's North Caucasus, Foreign Minister Sergey Lavrov said. ­"The more the Middle East becomes unstable, the higher is the risk of people with malicious intentions causing us trouble," Lavrov told Ekho Moskvy radio station on Wednesday. "Even during times of relative stability in the Middle and Near East we experienced an infiltration of terror from the region, moving from Afghanistan, Central Asia and then into the Russian Federation." The destabilization that has rocked the Middle East and North Africa started in Tunisia in December and spread like wildfire throughout the region, eventually forcing out of power Tunisian President Zine El Abidine Ben Ali and Egyptian President Hosni Mubarark. Meanwhile, Libyan strongman Muammar Gaddafi has unleashed a bloody crackdown on protesters, drawing harsh global condemnation. 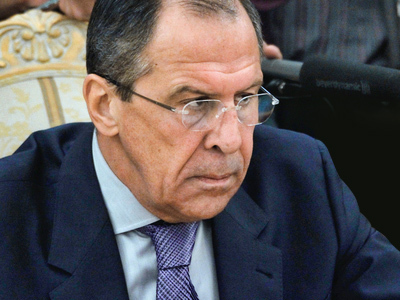 "This wave has never stopped,” Lavrov stressed. “On those occasions when the regimes were able to take isolated measures amid relative stability, [the wave of instability] would simply turn into a trickle. But when the structure responsible for the functioning of the state is in the process of breaking down, this wave would swell into a stream." Lavrov added that Russia will experience disturbances in the wake of the events in the Middle East regardless of who comes to power in these countries. Under such conditions, he added, individuals who wish to continue their malicious cause will find more opportunity. Russian President Dmitry Medvedev, during a February session of the National Counter-Terrorism Committee in Vladikavkaz, North Ossetia, rejected the suggestion that a Middle East scenario could occur in Russia. "They prepared such a scenario for us previously,” Medvedev said. “And now they will try to put it into practice. But in any case, this scenario will not succeed." However, Medvedev acknowledged the turmoil sweeping through the Middle East will have a "direct impact" on the situation in Russia. Meanwhile, Russia's Ambassador to NATO Dmitry Rogozin said he believes NATO would not intervene in Libya, where escalating violence between police and protesters is causing international alarm. However, "it is possible such a step may be taken by the United States and British forces," he said. However, Rogozin said he did not expect that something happening outside the framework of international law would happen. "So far, here in Brussels at NATO headquarters, they are only discussing the possibility of a no-flight zone over Libyan territory," he added. The Russian envoy emphasized that if the United States and Great Britain take any steps unilaterally, it would be considered as a violation of international law, as "this can be sanctioned only by the UN". 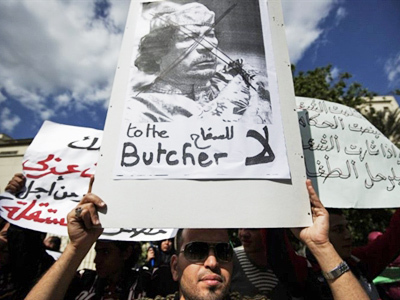 Libyan strongman Muammar Gaddafi has initiated a bloody crackdown on anti-government protesters, while vowing to die as a “martyr” rather than give up power. 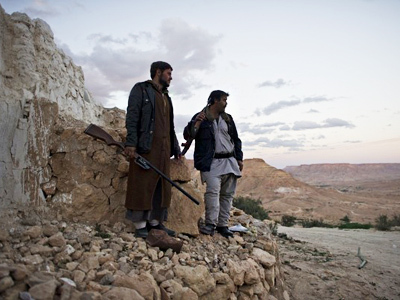 Gaddafi has ruled Libya since 1969, following a coup. Russia's ambassador to the UN, Vitaly Churkin, made public on February 27 Moscow's support of Libyan civilians during a UN Security Council resolution. All the parties to the conflict should display responsibility, observe international norms and guarantee human rights, the ambassador said. "Reliable security must be ensured for foreigners, including Russians, and it's important to provide all the conditions for their uninterrupted return home," Churkin said. 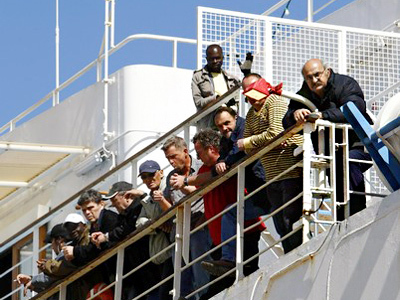 The resolution the Security Council endorsed imposes a ban on foreign trips by the Libyan leader, nine members of his family and six closest associates. The document that was endorsed unanimously also envisions a freeze on the bank accounts of Gaddafi, his son Seif al-Islam Gaddafi and another four family members. 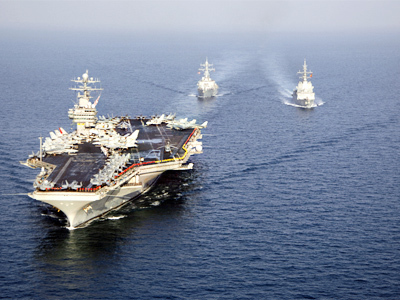 In addition, it mentions the possibility of an embargo on weapons supplies to Libya. 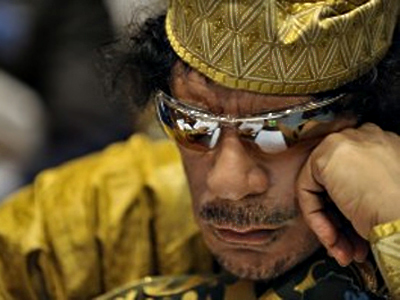 Gaddafi on Wednesday vowed to fight until the "last drop of blood," and warned that "thousands and thousands of Libyans will die" if the U.S. or NATO intervene.